Looking for a reasonably priced suitcase can be hard. It can also get harder when you have specific requirements to think about as well. With so many expensive options out there, and the constant advances in technology. The options are endless, and its normal to feel a bit overwhelmed! 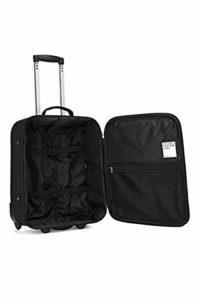 I recently purchased this Revelation cabin size black suitcase (CHECK PRICE NOW!) and I must admit it really is pretty great. Small and compact, but stylish and simple, I’m very pleased with my purchase. At an amazingly affordable price, you’re really getting good value for money here. Its pretty simple, but perfectly functional. 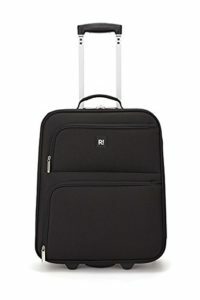 Revelation is a luggage company based in London, that have an impressive 94 years behind them. That is a really long time to be perfecting your product and brand so I know this is a brand i can trust. They pride themselves on being fashion forward and affordable which is great! The thing about this suitcase is that its amazingly simple. There aren’t really any frills or fancy bits which makes me think that the hard work has really gone into the basic and important bits of this suitcase. Its under the regulation carry on size, which is great, as so many airlines now are trying to hit you with hidden fees for cases being too big by mere millimetres. When I took this little case on a weekend business trip with me, I was able to carry everything I needed, with a capacity of 35 litres, its actually quite spacious. It is fully lined on the interior, and the internal pocket and packing straps meant I was able to pack really neatly and tidily. The soft outer also leaves a little more room for squashing and sitting on your case, so if you’re a little bit on the heavy packing side, you can always squeeze the zip closed. Nowadays, knowing the physical trauma our little cases go through in baggage handling is really quite scary. The strong polyester shell means that any damage it goes through means that, for the most part, it won’t show. But also that it can stand up really well against the heavy hands of baggage handlers. If this is the case, the zipper is also really strong. You can see the stitching is reinforced so theres no chance the zip is going to go anytime soon. The metal zippers them selves are also very sturdy. For me the two wheel wasn’t a problem here. The wheels are very strong and when you’re not in the airport, and two wheelers can travel really well over any surface. The case its self is pretty light weight weighing in at 2.8kg and the soft outer shell is made from polyester. I personally prefer a soft shell because I feel it can take a lot more damage, and ,literally, bounce back. There is a number lock included which is great, if you have to put your carry-on in the hold, which some airlines are initiating now, you know that your luggage will be safe and sound. So you can travel in peace, without worrying what will happen to the contents of your suitcase! There is an ID label on the case, which is held in a rubberised holder. So you can fill in your details and in the unlikely, but terribly annoying event that your case does go walk about, your details will be there for your case to be returned back to you safely! ID label – in a rubberised holder so you won’t lose your case! Two strong wheels – which run excellently on all terrains! Overall, I can’t fault this case. It is amazing value for money and I strongly recommend it. I’m going to be keeping an eye out for the Revelation brand in the future. Its not a brand I knew very well but i’m so glad I do now. It really did well on the trip I took it on and shows zero signs of damage. The company have done really well in making an affordable practical suitcase that really could work for anyone, of all ages and styles. It was effortlessly easy to purchase, pack and transport and didn’t have to buy a separate lock. It literally arrived at my door, ready to pack and go.